welcome - Vakantiehuis / Cottage D’Hoge Schure, Wijtschate - West-Flanders. Uniek vakantiehuis in de Westhoek. 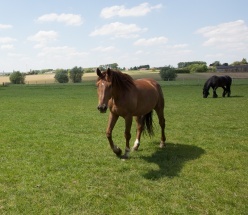 D'Hoge Schure is a charming cottage in a rural setting and offers all equestrian facilities. Enjoy the tranquillity or go hiking ? It's up to you ! D'Hoge Schure cottage is the perfect starting point for beautiful walks and excursions (with or without horse) in Heuvelland, Ypres and the westhoek region. We also welcome bikers ! Motorcycles can be parked in our closed hangar. Large private parking area for trailers.